My slow and erratic progress on documenting Numbami, the language I did fieldwork on in Papua New Guinea in 1976, suddenly gained traction on October 1, when I imported my old Numbami dictionary file into a new software package I had just been introduced to. Now dictionary work has taken precedence over blogging, photography, and other hobbies as I tediously clean up the many import errors and add many cross-references and reverse-entry keywords. After the cleanup, I'll have a printable Numbami-English and English-Numbami lexicon and be ready to digitize the text, glosses, and translations of several wonderful narratives I transcribed (in pencil) 35 years ago. Before I imported the dictionary data, I had begun to retranscribe one of my best narratives whose pencil transcription had gone missing many years ago. A couple years ago, a language documentation specialist at the University of Hawai‘i (my old alma mater) had converted my old cassette tapes to digital media (.WAV and .MP3 format), so I could use Transcriber to align the audio with the transcription. While underemployed in 1991, I had first input all my manual Numbami wordlist cards into Shoebox. In 2006, a friend helped me convert the Shoebox database into SIL's new and improved Toolbox. Now I have imported the Toolbox data into SIL's latest language documentation software package, FLEx, and have begun cleaning and recoding it. My host father (long deceased) was a retired schoolteacher and village kaunsil (elected representative to the local government council). He told me that a portion of the timber royalties from village land was allocated to help pay for the education of village youths, who had to leave the village even to attend elementary school. Timber royalties also helped pay for the small diesel vessel that carried people and goods back and forth along the mountainous coast, which lacked an overland highway. It was not until the 1990s that a Tok Ples (Vernacular) Skul was established in the village to teach basic literacy in the local language, before children went away to elementary school, where Tok Pisin was the lingua franca. I made a tiny contribution to getting it started by sending enough linguistic materials on Numbami to show that it had a workable orthography, which was a prerequisite for any Tok Ples Skul. But my work on the language was otherwise aimed at other linguists, for whom I hope eventually (after I retire) to finish a reference grammar of the language. But my priorities shifted over the past year from language description to language documentation, thanks to new technologies and new relationships. One factor was the new language documentation software mentioned above. The other was making new contacts via Facebook with well-educated grandchildren of my host father who have mastered English and Tok Pisin well, but know very little Numbami. They are my new target audience, not linguists and not people in the village who still speak the language (to the extent they do). The first paper I published after returning from my fieldwork in Papua New Guinea was on multilingualism and language mixture among the Numbami. If village residents want to find spouses they're not related to, they generally have to marry someone from a different language group. Unless both spouse and children live in the village, they don't learn more than the rudiments of the village language. The kids grow up speaking Tok Pisin, in any case. If they pursue education and job opportunities in town, they learn English, too. Nothing I can do will affect language use in the Numbami village. If people end up abandoning that language in favor of others more useful, I can't blame them. Villagers have been shifting language loyalties throughout the human history of New Guinea, for all sorts of reasons. The articles I've published so far are of little use to anyone except other linguists. But the dictionary I'm now editing may be useful both to a few linguists and to a few educated, town-dwelling people of partial Numbami heritage who want to learn more about their lost ancestral language, but who are accustomed to learning through the medium of English. Finally, the narrative texts may also be of at least historical interest to a third tiny audience of people who learned to speak Numbami in the village and to read it in the Tok Ples Skul. Of the nine million people who were on the territory of Soviet Belarus in 1941, some 1.6 million were killed by the Germans in actions away from battlefields, including about 700,000 prisoners of war, 500,000 Jews, and 320,000 people counted as partisans (the vast majority of whom were unarmed civilians). These three general campaigns constituted the three greatest German atrocities in eastern Europe, and together they struck Belarus with the greatest force and malice. Another several hundred thousand inhabitants of Soviet Belarus were killed in action as soldiers of the Red Army. The Soviet partisans also contributed to the total number of fatalities. They reported killing 17,431 people as traitors on the terrain of Soviet Belarus by 1 January 1944; this figure does not include civilians whom they killed for other reasons, or civilians whom they killed in the following months. In all, tens of thousands of people in Belarus were killed by the partisans in their own retribution actions (or, in the western regions taken from Poland, as class enemies). A few more tens of thousands of people native to the region certainly died after arrests during the Soviet occupation of 1939-1941 and especially during the Soviet deportations of 1940 and 1941, during the journey or in Kazakhstan. A rough estimate of two million total mortal losses on the territory of present-day Belarus during the Second World War seems reasonable and conservative. More than a million other people fled the Germans, and another two million were deported as forced labor or removed from their original residence for another reason. Beginning in 1944, the Soviets deported a quarter million more people to Poland and tens of thousands more to the Gulag. By the end of the war, half the population of Belarus had either been killed or moved. This cannot be said of any other European country. Minsk was transformed by the Germans into a kind of macabre theater, in which they could act out the ersatz victory of killing Jews. Terror itself was nothing new. People had been taken from Minsk to Tuchinka, in the black ravens of the NKVD, not so long before, in 1937 and 1938. Yet even at the height of Stalin’s Great Terror of those years, the NKVD was always discreet, taking people by ones and twos in the dark of night. The Germans were carrying out a mass action in the middle of the day, made for public consumption, ripe with meaning, suitable for a propaganda film. The staged parade was supposed to prove the Nazi claim that communists were Jews and Jews were communists. It followed from this, to the Nazi way of thinking, that their removal not only secured the rear area of Army Group Center but was also a kind of victory in itself. Yet this hollow expression of triumph seemed designed to disguise a more obvious defeat. By 7 November 1941, Army Group Center was supposed to have taken Moscow, and had not. Stalin was still in the Soviet capital, and was organizing his own victory celebrations. He had never abandoned the city, not during the initial offensive of Operation Barbarossa of June 1941, not during the secondary offensive of Operation Typhoon of October. Lenin’s embalmed corpse was sent away from the Kremlin for safekeeping, but Stalin remained and ruled. Leningrad was besieged, and Minsk and Kiev were taken, but Moscow defended itself under Stalin’s obstinate command. On the 6th of November, Stalin spoke defiantly to Soviet citizens. Noting that the Germans called their campaign a “war of annihilation,” he promised them the same. He referred, for the one and only time, to the Germans’ murder of the Jews. In calling the Nazi regime an empire eager to organize “pogroms,” however, he fell far short of a true description of the ongoing mass murder. The Minsk Jews taken to Tuchinka on 7 November (the Soviet holiday) were shot on 9 November (the National Socialist holiday). Five thousand more followed on 20 November. Traditional empires had never done anything like this to Jews. On any given day in the second half of 1941, the Germans shot more Jews than had been killed by pogroms in the entire history of the Russian Empire. The German murder of Jews was never going to play much of a role in the Soviet vision of the war. From a Stalinist perspective, it was not the killing of Jews that mattered but the possibilities for its political interpretation. The German identification of Jews with communism was not just a Nazi conviction and a pretext for mass murder; it was also a propaganda weapon against the Soviet Union. If the Soviet Union was nothing more than a Jewish empire, then surely (went the Nazi argument) the vast majority of Soviet citizens had no reason to defend it. In November 1941 Stalin was thus preparing an ideological as well as a military defense of the Soviet Union. The Soviet Union was not a state of the Jews, as the Nazis claimed; it was a state of the Soviet peoples, first among whom were the Russians. On 7 November, as the Jews marched through Minsk to their deaths, Stalin reviewed a military parade in Moscow. To raise the spirits of his Soviet peoples and to communicate his confidence to the Germans, he had actually recalled Red Army divisions from their defensive positions west of Moscow, and had them march through its boulevards. In his address that day he called upon the Soviet people to follow the example of their “great ancestors,” mentioning six prerevolutionary martial heroes—all of them Russians. At a time of desperation, the Soviet leader appealed to Russian nationalism. Stalin was associating himself and his people with the earlier Russian Empire, which just one day before he had mentioned in connection with pogroms of Jews. As the General Secretary of the Communist Party of the Soviet Union summoned the heroes of prerevolutionary Russian history, he had to negotiate with their ghosts. By placing Russians at the center of history, he was implicitly reducing the role of other Soviet peoples, including those who suffered more than Russians from the German occupation. If this was a “Great Patriotic War,” as Stalin’s close associate Viacheslav Molotov had said on the day of the German invasion, what was the fatherland? Russia, or the Soviet Union? If the conflict was a war of Russian self-defense, what to make of the German mass murder of the Jews? Hitler’s public anti-Semitism had placed Stalin, like all the leaders of the Allies, in a profound dilemma. Hitler said that the Allies were fighting for the Jews, and so (fearing that their populations might agree) the Allies had to insist that they were fighting to liberate oppressed nations (but not Jews in particular). Stalin’s answer to Hitler’s propaganda shaped the history of the Soviet Union for as long as it existed: all of the victims of German killing policies were “Soviet citizens,” but the greatest of the Soviet nations was the Russians. One of his chief propagandists, Aleksandr Shcherbakov, clarified the line in January 1942: “the Russian people—the first among equals in the USSR’s family of peoples—are bearing the main burden of the struggle with the German occupiers.” By the time Shcherbakov uttered those words, the Germans had killed a million Jews east of the Molotov-Ribbentrop line, including some 190,000 Jews in Belarus. Minsk was an unusual city, a place whose social structure defied the Nazi mind as well as German experience in occupied Poland. Here, in a Soviet metropolis, the history of Jews had taken a different turn than in Poland. Twenty years of social opportunity and political coercion had done their work. The urbane Jews of the city were not organized in any sort of traditional community, since the Soviets had destroyed Jewish religious and communal institutions in the 1920s and 1930s. The younger generation of Jews was highly assimilated, to the point that many had “Belarusian” or “Russian” inscribed as their nationality on their Soviet documents. Although this probably meant little to them before 1941, it could save their lives under German rule. Some Minsk Jews had Belarusian or Russian friends and colleagues who were ignorant of or indifferent to religion and nationality. A striking example of the ignorance of Jewish origins was Isai Kaziniets, who organized the communist underground throughout the city of Minsk. Neither his friends nor his enemies knew that he was Jewish. Soviet rule had brought a certain sort of toleration and assimilation, at the price of habits of subordination and obedience to the commands of Moscow. Political initiative had not been rewarded in Stalin’s Soviet Union. Anyone responding with too much avidity to a given situation, or even to a political line, was at risk when the situation or the line changed. Thus Soviet rule in general, and the Great Terror of 1937-1938 in particular, had taught people not to take spontaneous action. People who had distinguished themselves in the Minsk of the 1930s had been shot by the NKVD at Kuropaty. Even when it must have been clear in Moscow that Soviet citizens in Minsk had their own reasons to resist Germans, communists understood that this would not be enough to protect them from future persecution when the Soviets returned. Kaziniets and all local communists hesitated to create any sort of organization, knowing that Stalinism opposed any sort of spontaneous action from below. Left to themselves, they would have endured Hitler for fear of Stalin. An outsider, the Polish-Jewish communist Hersh Smolar, helped spur Minsk communists and Jews to action. His curious combination of Soviet and Polish experience provided him with the skills (and, perhaps, the naiveté) to push forward. He had spent the early 1920s in the Soviet Union, and spoke Russian—the main language of Minsk. After returning to a Poland where the communist party was illegal, he grew accustomed to operating underground and working against local authorities. Arrested by the Polish police and imprisoned, he had been spared the experiences of Stalinist mass shooting that weighed so heavily in Minsk. He was behind bars during the Great Terror of 1937-1938, when Polish communists were invited to the Soviet Union in order to be shot. Released from Polish prison when the Soviet Union invaded Poland in September 1939, Smolar served the new Soviet regime. He fled the Germans on foot in June 1941, and got as far as Minsk. After the German occupation of the city, he began to organize the ghetto underground, and persuaded Kaziniets that a general city underground was permissible as well. Kaziniets wanted to know whom Smolar was representing; Smolar told him truthfully that he stood for no one but himself. This denial seemed to have persuaded Kaziniets that Smolar was actually authorized by Moscow to work under deep cover. Both men found a large number of willing conspirators within and without the ghetto; by early autumn 1941 both the ghetto and the city were thoroughly penetrated by a dedicated communist underground movement. The underground subverted the organs of German control over Jewish life, the Judenrat and the Jewish police. In the occupied Soviet Union, as in occupied Poland, German rule forced Jews into ghettos, which were administered by a local Jewish council typically known by the German term Judenrat. In the cities of occupied Poland, the Judenrat was often composed of Jews of some standing in the prewar community, often the same people who had led the Jewish communal structures that had been legal in independent Poland. In Minsk, such continuity of Jewish leadership was impossible, since the Soviets had eliminated Jewish communal life. The Germans had no easy way to find people who represented Jewish elites, and who were accustomed to making compromises with the local authorities. It seems that they chose the initial Minsk Judenrat more or less at random—and chose badly. The entire Judenrat cooperated with the underground. In late 1941 and early 1942, Jews who wished to flee the ghetto could count on help from the Judenrat. Jewish policemen would be stationed away from places where escape attempts were planned. Because the Minsk ghetto was enclosed only by barbed wire, the momentary absence of police attention allowed people to flee to the forest—which was very close to the city limits. Very small children were passed through the barbed wire to gentiles who agreed to raise them or take them to orphanages. Older children learned the escape routes, and came to serve as guides from the city to the nearby forest. Sima Fiterson, one of these guides, carried a ball, which she would play with to signal danger to those following behind her. Children adapted quickly and well, but were in terrible danger all the same. To celebrate that first Christmas under German occupation, Erich von dem Bach-Zelewski, the Higher SS and Police Leader, sent thousands of pairs of children’s gloves and socks to SS families in Germany. Unlike Jews elsewhere under German occupation, Jews in Minsk had somewhere to run. In the nearby forest, they could try to find Soviet partisans. They knew that the Germans had taken countless prisoners of war, and that some had escaped to the forests. These men had stayed in the woods because they knew that the Germans would shoot them or starve them. Stalin had called in July 1941 for loyal communists to organize partisan units behind the lines, in the hope of establishing some control over this spontaneous movement before it grew in importance. Centralization was not yet possible; the soldiers hid in the forest, and the communists, if they had not fled, did their best to hide their pasts from the Germans. The Minsk underground activists, however, did try to support their armed comrades. On at least one occasion, members of the ghetto underground liberated a Red Army officer from the camp on Shirokaia Street; he became an important partisan leader in the nearby forests, and saved Jews in his turn. Jewish laborers in German factories stole winter clothes and boots, meant for the German soldiers of Army Group Center, and diverted them to the partisans. Workers in arms factories, remarkably, did the same. The Judenrat, required to collect a regular “contribution” of money from the Jewish population of the ghetto, diverted some of these funds to the partisans. The Germans later concluded that the entire Soviet partisan movement was funded from the ghetto. This was an exaggeration arising from stereotypical ideas of Jewish wealth, but the aid from the Minsk ghetto was reality. During our recent travels to far-outlying corners of Japan we came across several local specialties that I had never heard of before. When I solicit the names for new dishes in Japanese, I often end up learning new fish names in English, just as I did long ago doing linguistic fieldwork in a coastal village in Papua New Guinea. 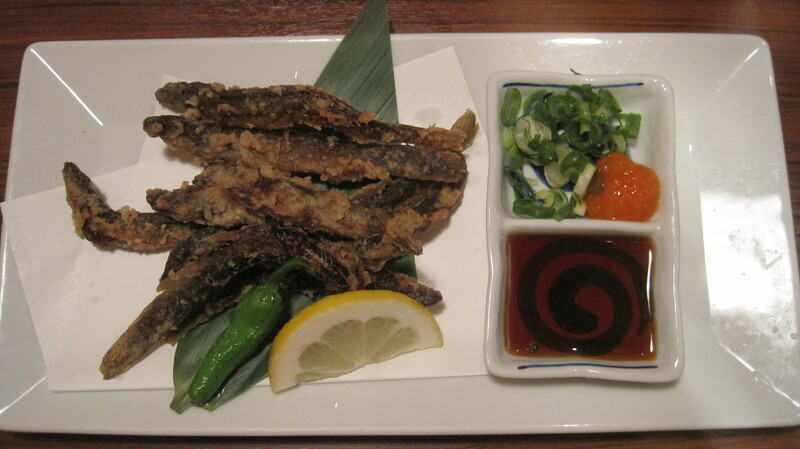 Here is a sample of new fish we tried at izakaya last month. 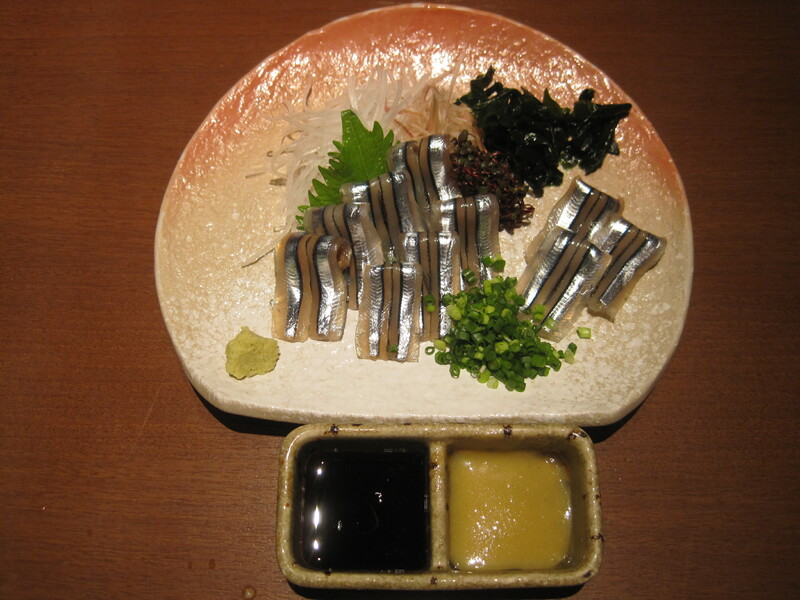 At the fine Umaya Restaurant beside JR Kumamoto Station, we ordered kibinago sashimi. After failing to find kibinago in my old Canon Wordtank G55 electronic dictionary, I asked the waitress if she could find out what to call it in English. She came back and showed me the gloss in her electronic dictionary, 'silver-stripe round herring'. This slender sprat, Spratelloides gracilis, is often used as a bait fish, but also makes a very attractive dish of sashimi. On the way up from Kyushu, we stopped overnight at Shin-Yamaguchi, an old railway junction city (Ogōri) that was renamed and upgraded to a Shinkansen station but still proudly displays memorabilia from the old days. The owner of the izakaya we had dinner at was a train buff and the walls of our booth were covered with posters and photos of old steam locomotives. 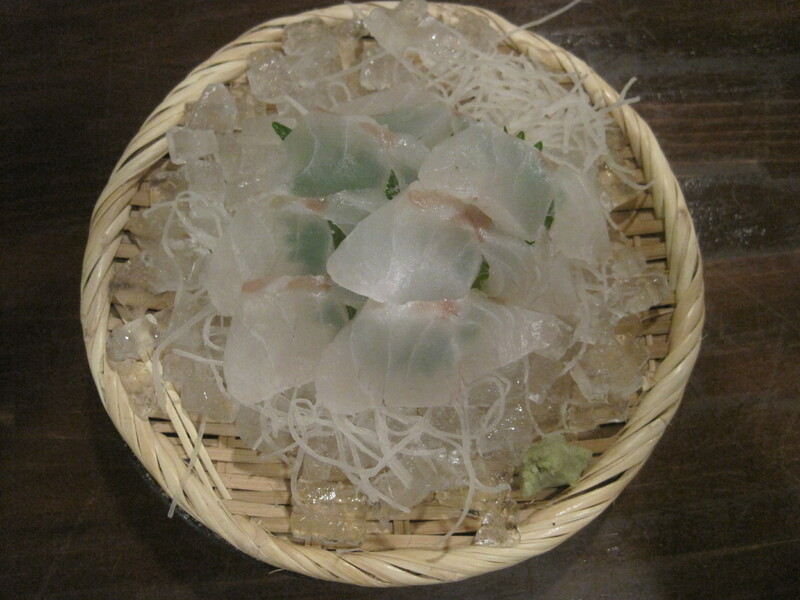 Among the novelties we ate there was shako sashimi, mantis shrimp (Squilla sp.) 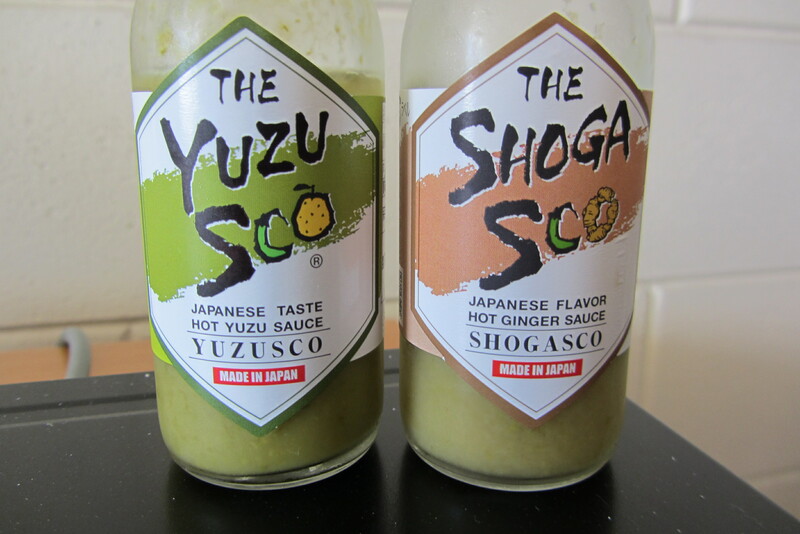 with ginger mustard sauce to counter the fishy taste. This creature I could find in my electronic dictionary, so I tortured the waitress with questions about old trains. We both recalled the days when the steam locomotive whistle would signal an upcoming tunnel, and we would quickly close the window so as not to get a faceful of soot. The next day we boarded the Super-Oki limited express bound for the Japan Sea coast and up the San'in Main Line. After making a quick visit to Tottori's famous sand dunes just in time for the sunset, our taxi driver called his contacts at Daizen, a busy new izakaya that he recommended when I asked where we could find a place that served local specialties. 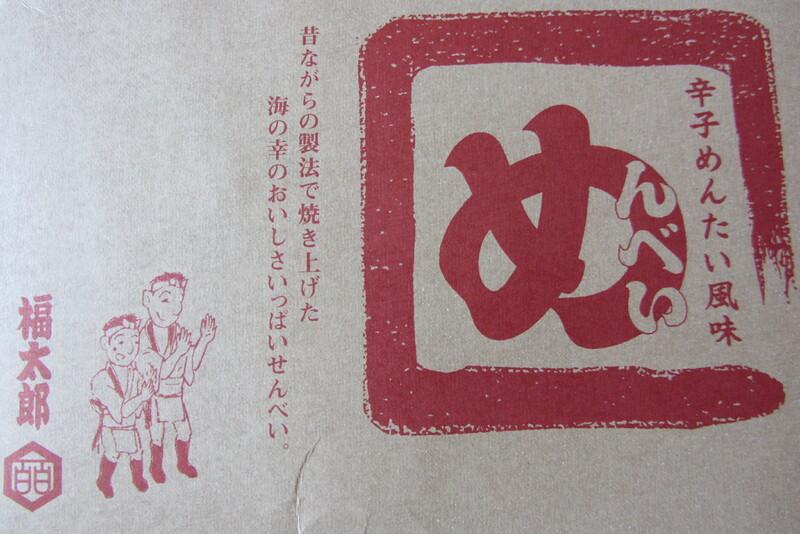 We ordered fried gobo chips, which are gaining popularity, and we ate two fish that were new to us. One was loach, 泥鰌 dojou (lit. 'mud-loach') 'dojo loach', Misgurnus anguillicaudatus, also called 'weatherloach', a member of the carp order (Cypriniformes). 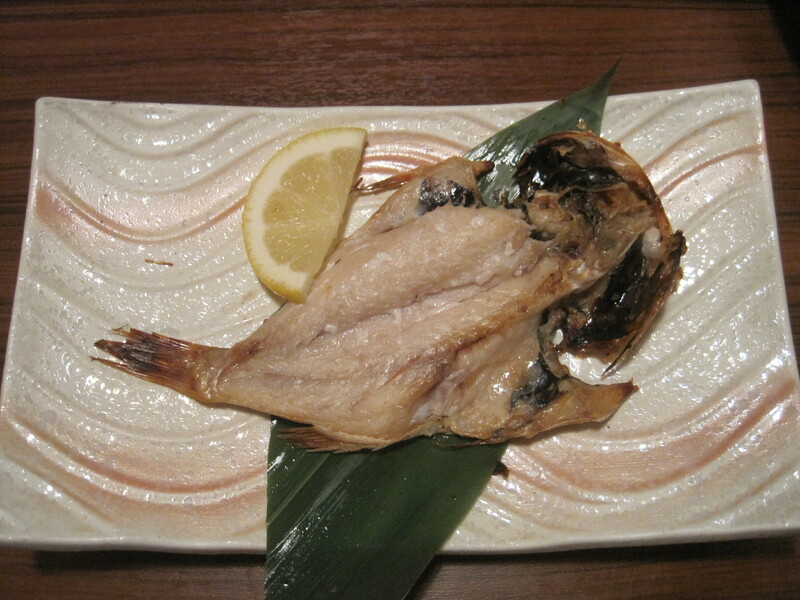 The other was broiled nodoguro (lit. 'black throat') 'rosy sea bass', Doederleinia berycoides (also called 赤鯥 akamutsu 'red gnomefish') in the family Acropomatidae (lanternbellies, Jp. hotarujako 'firefly fry'). At a small mamasan-without-papasan izakaya next to our hotel in Tsuruga, we tried mejina nitsuke 'poached nibbler'. The Japanese name, 眼仁奈 mejina applies to both the genus Girella and the subfamily Girellinae 'nibblers', members of the Kyphosidae (sea chub) family in the order Perciformes. We spent a long time talking with everyone else there: the very hospitable self-employed proprietor, who served as her own buyer, cook, and waitress (and single mother); a very talkative traveling digger and inspector of wells and tunnels; and three ladies from Shikoku on a hiking trip, one of whom had a daughter just back from Ethiopia with JICA. Our second evening in Tsuruga we went to a much larger izakaya that had been too busy by the time we showed up the night before. 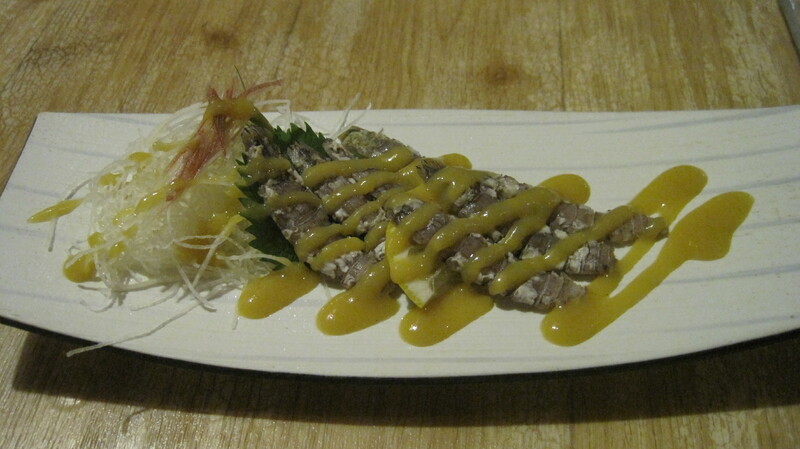 There we had suzuki sashimi, which our waitress described as light and tasty when I asked what kind of fish it was. 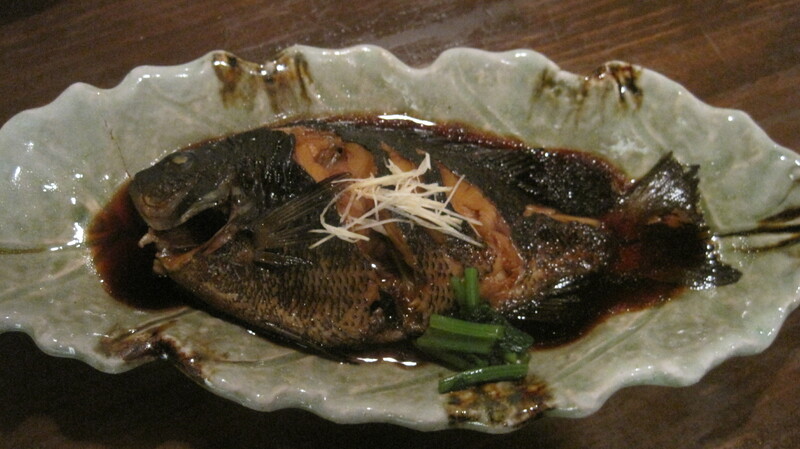 I hadn't heard suzuki as a fish name, but in Japanese taxonomy, 鱸 suzuki 'Japanese sea bass or sea perch', Lateolabrax japonicus seems to be the type species or genus for a whole suborder and order of bony fish, the equivalent of Perc- in Percoidei (スズキ亜目) and Perciformes (スズキ目). When the Wehrmacht transported Soviet prisoners by train, it used open freight cars, with no protection from the weather. When the trains reached their destinations, hundreds or sometimes even thousands of frozen corpses would tumble from the opened doors. Death rates during transport were as high as seventy percent. Perhaps two hundred thousand prisoners died in these death marches and these death transports. All of the prisoners who arrived in the eighty or so prisoner-of-war camps established in the occupied Soviet Union were tired and hungry, and many were wounded or ill.
Ordinarily, a prisoner-of-war camp is a simple facility, built by soldiers for other soldiers, but meant to preserve life. Such camps arise in difficult conditions and in unfamiliar places; but they are constructed by people who know that their own comrades are being held as prisoners by the opposing army. German prisoner-of-war camps in the Soviet Union, however, were something far out of the ordinary. They were designed to end life. In principle, they were divided into three types: the Dulag (transit camp), the Stalag (base camp for enlisted men and noncommissioned officers), and the smaller Oflags (for officers). In practice, all three types of camps were often nothing more than an open field surrounded by barbed wire. Prisoners were not registered by name, though they were counted. This was an astonishing break with law and custom. Even at the German concentration camps names were taken. There was only one other type of German facility where names were not taken, and it had not yet been invented. No advance provision was made for food, shelter, or medical care. There were no clinics and very often no toilets. Usually there was no shelter from the elements. The official calorie quotients for the prisoners were far below survival levels, and were often not met. In practice, only the stronger prisoners, and those who had been selected as guards, could be sure of getting any food at all. It was the Wehrmacht that established and ran the first network of camps, in Hitler’s Europe, where people died in the thousands, the tens of thousands, the hundreds of thousands, and finally the millions. Some of the most infamous prisoner-of-war camps were in occupied Soviet Belarus, where by late November 1941 death rates had reached two percent per day. At Stalag 352 near Minsk, which one survivor remembered as “pure hell,” prisoners were packed together so tightly by barbed wire that they could scarcely move. They had to urinate and defecate where they stood. Some 109,500 people died there. At Dulag 185, Dulag 127, and Stalag 341, in the east Belarusian city Mahileu, witnesses saw mountains of unburied corpses outside the barbed wire. Some thirty to forty thousand prisoners died in these camps. At Dulag 131 at Bobruisk, the camp headquarters caught fire. Thousands of prisoners burned to death, and another 1,700 were gunned down as they tried to escape. All in all at least thirty thousand people died at Bobruisk. At Dulags 220 and 121 in Homel, as many as half of the prisoners had shelter in abandoned stables. The others had no shelter at all. In December 1941 death rates at these camps climbed from two hundred to four hundred to seven hundred a day. At Dulag 342 at Molodechno, conditions were so awful that prisoners submitted written petitions asking to be shot. The camps in occupied Soviet Ukraine were similar. At Stalag 306 at Kirovohrad, German guards reported that prisoners ate the bodies of comrades who had been shot, sometimes before the victims were dead. Rosalia Volkovskaia, a survivor of the women’s camp at Volodymyr Volynskyi, had a view of what the men faced at the local Stalag 365: “we women could see from above that many of the prisoners ate the corpses.” At Stalag 346 in Kremenchuk, where inmates got at most two hundred grams of bread per day, bodies were thrown into a pit every morning. As in Ukraine in 1933, sometimes the living were buried along with the dead. At least twenty thousand people died in that camp. At Dulag 162 in Stalino (today Donetsk), at least ten thousand prisoners at a time were crushed behind barbed wire in a small camp in the center of the city. People could only stand. Only the dying would lie down, because anyone who did would be trampled. Some twenty-five thousand perished, making room for more. Dulag 160 at Khorol, southwest of Kiev, was one of the larger camps. Although the site was an abandoned brick factory, prisoners were forbidden to take shelter in its buildings. If they tried to escape there from the rain or snow, they were shot. The commandant of this camp liked to observe the spectacle of prisoners struggling for food. He would ride in on his horse amidst the crowds and crush people to death. In this and other camps near Kiev, perhaps thirty thousand prisoners died. Soviet prisoners of war were also held at dozens of facilities in occupied Poland, in the General Government (which had been extended to the southeast after the invasion of the Soviet Union). Here astonished members of the Polish resistance filed reports about the massive death of Soviet prisoners in the winter of 1941-1942. Some 45,690 people died in the camps in the General Government in ten days, between 21 and 30 October 1941. At Stalag 307 at Dęblin, some eighty thousand Soviet prisoners died over the course of the war. At Stalag 319 at Chełm some sixty thousand people perished; at Stalag 366 in Siedlce, fifty-five thousand; at Stalag 325 at Zamość, twenty-eight thousand; at Stalag 316 at Siedlce, twenty-three thousand. About half a million Soviet prisoners of war starved to death in the General Government. As of the end of 1941, the largest group of mortal victims of German rule in occupied Poland was neither the native Poles nor the native Jews, but Soviet prisoners of war who had been brought west to occupied Poland and left to freeze and starve. Despite the recent Soviet invasion of Poland, Polish peasants often tried to feed the starving Soviet prisoners they saw. In retaliation, the Germans shot the Polish women carrying the milk jugs, and destroyed whole Polish villages. The German prisoner-of-war camps in the East were far deadlier than the German concentration camps. Indeed, the existing concentration camps changed their character upon contact with prisoners of war. Dachau, Buchenwald, Sachsenhausen, Mauthausen, and Auschwitz became, as the SS used them to execute Soviet prisoners of war, killing facilities. Some eight thousand Soviet prisoners were executed at Auschwitz, ten thousand at Mauthausen, eighteen thousand at Sachsenhausen. At Buchenwald in November 1941, the SS arranged a method of mass murder of Soviet prisoners that strikingly resembled Soviet methods in the Great Terror, though exhibiting greater duplicity and sophistication. Prisoners were led into a room in the middle of a stable, where the surroundings were rather loud. They found themselves in what seemed to be a clinical examination room, surrounded by men in white coats—SS-men, pretending to be doctors. They would have the prisoner stand against the wall at a certain place, supposedly to measure his height. Running through the wall was a vertical slit, which the prisoner’s neck would cover. In an adjoining room was another SS-man with a pistol. When he saw the neck through the slit, he would fire. The corpse would then be thrown into a third room, the “examination room,” be quickly cleaned, and the next prisoner invited inside. Batches of thirty-five to forty corpses would be taken by truck to a crematorium: a technical advance over Soviet practices. The Germans shot, on a conservative estimate, half a million Soviet prisoners of war. By way of starvation or mistreatment during transit, they killed about 2.6 million more. All in all, perhaps 3.1 million Soviet prisoners of war were killed. The brutality did not bring down the Soviet order; if anything, it strengthened Soviet morale. The screening of political officers, communists, and Jews was pointless. Killing such people, already in captivity, did not much weaken the Soviet state. In fact, the policies of starvation and screening stiffened the resistance of the Red Army. If soldiers knew that they would starve in agony as German captives, they were certainly more likely to fight. If communists and Jews and political officers knew that they would be shot, they too had little reason to give in. As knowledge of German policies spread, Soviet citizens began to think that Soviet power was perhaps the preferable alternative. In these years of the Popular Front, the Soviet killings and deportations went unnoticed in Europe. Insofar as the Great Terror was noticed at all, it was seen only as a matter of show trials and party and army purges. But these events, noticed by specialists and journalists at the time, were not the essence of the Great Terror. The kulak operations and the national operations were the essence of the Great Terror. Of the 681,692 executions carried out for political crimes in 1937 and 1938, the kulak and national orders accounted for 625,483. The kulak action and the national operations brought about more than nine tenths of the death sentences and three quarters of the Gulag sentences. The Great Terror was thus chiefly a kulak action, which struck most heavily in Soviet Ukraine, and a series of national actions, the most important of them the Polish, where again Soviet Ukraine was the region most affected. Of the 681,692 recorded death sentences in the Great Terror, 123,421 were carried out in Soviet Ukraine—and this figure does not include natives of Soviet Ukraine shot in the Gulag. Ukraine as a Soviet republic was overrepresented within the Soviet Union, and Poles were overrepresented within Soviet Ukraine. The Great Terror was a third Soviet revolution. Whereas the Bolshevik Revolution had brought a change in political regime after 1917, and collectivization a new economic system after 1930, the Great Terror of 1937-1938 involved a revolution of the mind. Stalin had brought to life his theory that the enemy could be unmasked only by interrogation. His tale of foreign agents and domestic conspiracies was told in torture chambers and written in interrogation protocols. Insofar as Soviet citizens can be said to have participated in the high politics of the late 1930s, it was precisely as instruments of narration. For Stalin’s larger story to live on, their own stories sometimes had to end. The Soviet Union was a multinational state, using a multinational apparatus of repression to carry out national killing campaigns. At the time when the NKVD was killing members of national minorities, most of its leading officers were themselves members of national minorities. In 1937 and 1938, NKVD officers, many of whom were of Jewish, Latvian, Polish, or German nationality, were implementing policies of national killing that exceeded anything that Hitler and his SS had (yet) attempted. In carrying out these ethnic massacres, which of course they had to if they wished to preserve their positions and their lives, they comprised an ethic of internationalism, which must have been important to some of them. Then they were killed anyway, as the Terror continued, and usually replaced by Russians. The Jewish officers who brought the Polish operation to Ukraine and Belarus, such as Izrail Leplevskii, Lev Raikhman, and Boris Berman, were arrested and executed. This was part of a larger trend. When the mass killing of the Great Terror began, about a third of the high-ranking NKVD officers were Jewish by nationality. By the time Stalin brought it to an end on 17 November 1938, about twenty percent of the high-ranking officers were. A year later that figure was less than four percent. The Great Terror could be, and by many would be, blamed on the Jews. To reason this way was to fall into a Stalinist trap: Stalin certainly understood that Jewish NKVD officers would be a convenient scapegoat for national killing actions, especially after both the Jewish secret policemen and the national elites were dead. In any event, the institutional beneficiaries of the Terror were not Jews or members of other national minorities but Russians who moved up in the ranks. By 1939 Russians (two thirds of the ranking officers) had replaced Jews at the heights of the NKVD, a state of affairs that would become permanent. Russians became an overrepresented national majority; their population share at the heights of the NKVD was greater than their share in the Soviet population generally. The only national minority that was highly overrepresented in the NKVD at the end of the Great Terror were the Georgians—Stalin’s own. This third revolution was really a counterrevolution, implicitly acknowledging that Marxism and Leninism had failed. In its fifteen or so years of existence, the Soviet Union had achieved much for those of its citizens who were still alive: as the Great Terror reached its height, for example, state pensions were introduced. Yet some essential assumptions of revolutionary doctrine had been abandoned. Existence, as the Marxists had said, no longer preceded essence. People were guilty not because of their place in a socioeconomic order but because of their ostensible personal identities or cultural connections. Politics was no longer comprehensible in terms of class struggle. If the diaspora ethnicities of the Soviet Union were disloyal, as the case against them went, it was not because they were bound to a previous economic order but because they were supposedly linked to a foreign state by their ethnicity. The link between loyalty and ethnicity was taken for granted in the Europe of 1938. Hitler was using this very argument, at this very time, to claim that the three million Germans of Czechoslovakia, and the regions they inhabited, must be allowed to join Germany. In September 1938 at a conference in Munich, Britain, France, and Italy had agreed to let Germany annex the western rim of Czechoslovakia, where most of those Germans lived. British Prime Minister Neville Chamberlain declared that the arrangement had brought “peace for our time.” French Prime Minister Edouard Daladier believed nothing of the sort, but he allowed the French people to indulge the fancy. The Czechoslovaks were not even invited to the conference, and were simply expected to accept the result. The Munich agreement deprived Czechoslovakia of the natural protection of mountain ranges and the fortifications therein, leaving the country vulnerable to a future German attack. Stalin interpreted the settlement to mean that the Western powers wished to make concessions to Hitler in order to turn the Germans toward the East. On a visit to the Kehi Matsubara pine grove and beach, we stopped at a shady refreshment stand to get some cool drinks. Near the vending machine sat two elderly men, one grizzled and talkative, the other silent and dignified. The grizzled man seemed to have saved up many things he wanted to share with English-speakers, starting with his futile attempts to learn our language. His teachers had concentrated too much on grammar, he said, and the only English phrase he could reliably remember for all his trouble was "I forgot." He said Chinese speakers had much greater success learning English because of the similarities in word order between the two languages, and that Mongolian sumo wrestlers learned Japanese much more quickly than the European wrestlers for similar reasons. He was originally from Kochi (formerly Tosa) in Shikoku, and when I asked about the famous Tosa fighting dogs, he launched into a long disquisition on their virtues (such as silently enduring pain like samurai) and superiority over Akita dogs, which might be larger but lacked the same degree of fighting temperament. His dignified companion, who never got a word in edgewise, was a former officer in the Imperial Japanese Navy who was recruited by the Occupation authorities to clear mines from the harbor. The word (new to me) that Mr. Grizzly used for 'naval mine' was 魚雷 gyorai lit. 'fish-thunder', which more commonly refers to torpedoes, as in 魚雷艇 gyoraitei 'torpedo boat'. (Torpedoes are also called "fish" in anglophone sailor slang.) Aerial torpedoes are 空雷 kuurai 'air-thunder' and a torpedo attack is 雷撃 raigeki 'thunder-attack'. 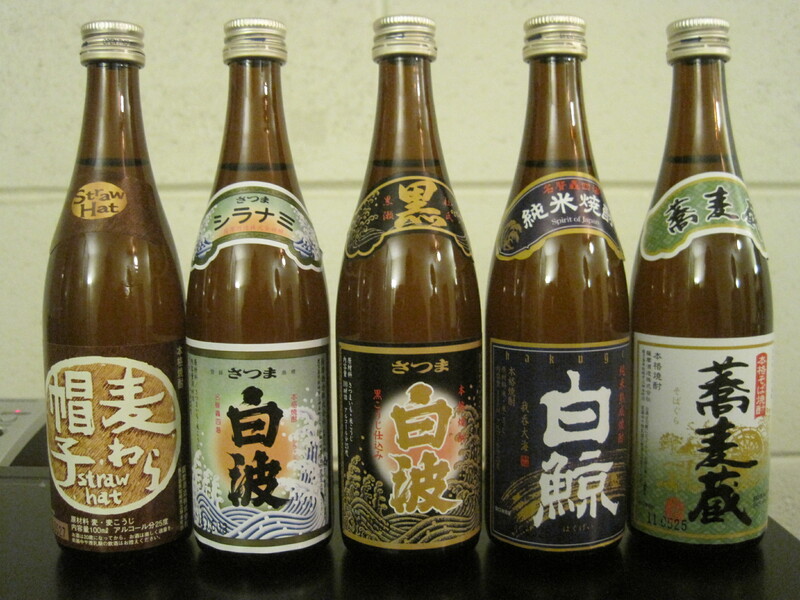 The generic word for 'mine' is 機雷 kirai 'device-thunder'. Naval mines are 水雷 suirai 'water-thunder' and land mines are 地雷 jirai 'earth-thunder', as in 地雷原 jiraigen 'minefield'. This encounter reminded me of a story my Uncle Murray told for the first time back in April, when I had the chance to attend a brief reunion of my father and his only two surviving brothers. Uncle Murray reached draft age right at the end of World War II and he was on his way to invade Japan in August 1945 when Japan surrendered and his ship put into Midway to await a change of orders. His unit was then rerouted to the Philippines, where they assembled Japanese POWs as they surrendered and then put them to work helping to dismantle and destroy military stockpiles near Manila. His POWs would load electrical equipment onto amphibious ducks, which he would then drive out to sea, where the POWs would drill holes in the batteries and dump them in the ocean, often getting very seasick in the process. Much of Manila had been destroyed during the war, and Uncle Murray said his unit's battery disposals must have destroyed a lot of life in the surrounding seas as well. Thirteen months after the Molotov-Ribbentrop Pact had alienated Tokyo from Berlin, German-Japanese relations were reestablished on the basis of a military alliance. On 27 September 1940, Tokyo, Berlin, and Rome signed a Tripartite Pact. At this point in time, when the central conflict in the European war was the air battle between the Royal Air Force and the Luftwaffe, Japan hoped that this alliance might be directed at Great Britain. Tokyo urged upon the Germans an entirely different revolution in world political economy than the one German planners envisioned. Rather than colonizing the Soviet Union, thought the Japanese, Nazi Germany should join with Japan and defeat the British Empire. The Japanese, building their empire outward from islands, understood the sea as the method of expansion. It was in the interest of Japan to persuade the Germans that the British were the main common enemy, since such agreement would aid the Japanese to conquer British (and Dutch) colonies in the Pacific. Yet the Japanese did have a vision on offer to the Germans, one that was broader than their own immediate need for the mineral resources from British and Dutch possessions. There was a grand strategy. Rather than engage the Soviet Union, the Germans should move south, drive the British from the Near East, and meet the Japanese somewhere in South Asia, perhaps India. If the Germans and the Japanese controlled the Suez Canal and the Indian Ocean, went Tokyo’s case, British naval power would cease to be a factor. Germany and Japan would then become the two world powers. Hitler showed no interest in this alternative. The Germans told the Soviets about the Tripartite Pact, but Hitler never had any intention of allowing the Soviets to join. Japan would have liked to see a German-Japanese-Soviet coalition against Great Britain, but this was never a possibility. Hitler had already made up his mind to invade the Soviet Union. Though Japan and Italy were now Germany’s allies, Hitler did not include them in his major martial ambition. He assumed that the Germans could and should defeat the Soviets themselves. The German alliance with Japan would remain limited by underlying disagreements about goals and enemies. The Japanese needed to defeat the British, and eventually the Americans, to become a dominant naval empire in the Pacific. The Germans needed to destroy the Soviet Union to become a massive land empire in Europe, and thus to rival the British and the Americans at some later stage. Japan had been seeking a neutrality pact with the Soviet Union since summer 1940; one was signed in April 1941. Chiune Sugihara, the Soviet specialist among Japanese spies, spent that spring in Königsberg, the German city in East Prussia on the Baltic Sea, trying to guess the date of the German invasion of the Soviet Union. Accompanied by Polish assistants, he made journeys through eastern Germany, including the lands that Germany had seized from Poland. His estimation, based upon observations of German troop movements, was mid-June 1941. His reports to Tokyo were just one of thousands of indications, sent by intelligence staffs in Europe and around the world, that the Germans would break the Molotov-Ribbentrop Pact and invade their ally in late spring or early summer.